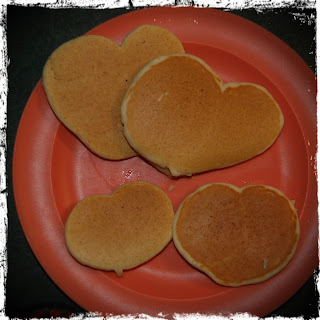 This morning I made my boys some heart shaped pancakes. Nothing fancy. I didn't have a special cutter. I didn't cut little heart shaped strawberries to put on top (although my belly is a little sad that I didn't). The mix came from a box (although I did step it up from the "just add water" variety--because there's some of that in my pantry too). I didn't even bother to put it on a regular plate (as in not plastic). I just poured the batter with a little more care than usual. Sorry Pinterest, but today I'm being real. Because today, the intention and thought went a lot further than the presentation...and that's what this greeting card holiday is really all about.